Louis Armstrong had a tectonic effect on Western music. It wasn’t just his voice—which was unmistakable. It wasn’t his smile, which could be shakeable. It wasn’t that he could hear a song once and never need reminding. Nor that he could hit 200 high C’s or that he played with everyone from street bands to symphony orchestras. It wasn’t even his plangent, blistering tone. What set Louis apart was the feeling behind his swing, the emotional moment of his attack. Any of his turns could lift you off the ground and keep you there. Every phrase told a story. The 1920s trumpeter Max Kaminsky recalled, “The combination of Louis’ dazzling virtuosity and sensational brilliance of tone so overwhelmed me that I felt as if I had stared into the sun’s eye.” Louis’ notes moved toward you at the speed of light. How did such talent originate? What personal, cultural, and historical elements conspired to create such genius in one so poor, black, and uneducated? 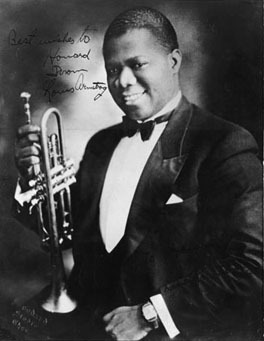 With photography of early New Orleans, turn-of-century brass band music, and Louis’ first 1920s Chicago recordings, Louis Armstrong: The Early Years covers Louis’ musical training, his roots in vocal quartets, the neighborhood parades he loved, his home, family and church, and his relationship with the Karnofskys—Lithuanian Jewish immigrants who helped raise him. The talk reveals how Louis and his workingmen’s cohort alchemically turned their slave legacy into one of molten joy and musical revolution. A classic New Orleans piece replete with polyrhythm and polyphony. straight into the fiery final ensemble.